This isn’t your grandpa’s magic square! 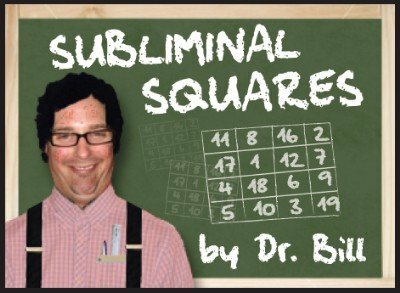 Dr. Bill originally released Subliminal Square as an alternative to the traditional instant magic square plot. Instead of the mentalist rapidly completing the square with a number provided by an audience member, using a Subliminal Square he rapidly implants a number into the subconscious mind of an audience member! This innovation in mentalism was first seen in Banachek’s Psychological Subtleties 2 and received wide critical acclaim and near instant classic status. It quickly became a staple in the repertoires of many working pros. Subliminal Square took a new turn in Sublime Subliminal Square, one of the most popular effects in Dr. Bill's ebook, The Fource. Not requiring "The Fource" force, Sublime Subliminal Square can be performed on the entire audience at once. Now imagine Subliminal Square and Sublime Subliminal Square having a love child! That should give you an inkling of Bill's latest subliminal tour de force. No longer requiring any special props, sleight of hand or math under pressure, you are freed up to concentrate on the devastating presentation. You will want to carry this with you in your wallet at all times, preparing yourself to wow one person or 1000. All three versions are included in Subliminal Squares as is the alternative “Savant Square” presentation, turning audience members into instantaneous math savants. And as if that weren’t enough, get ready for world-class contributions from the acts of some of the best minds in mentalism. Dr. Todd Landman, Steve Pellegrino, Rich Hennessey, Greg Arce and Joshua Quinn all give up the goods. They share everything from their own refinements to complete routines they are performing on a regular basis. A folder of templates covering everything from business cards to auditorium size Power Point projections is also included. The templates are set up to personalize with your own advertising material or to make the squares specific to that corporate gig you have coming up. A generic scientific “test kit” version is also included.